3M Micropore Surgical Adhesive Plaster 9,14m x 2,5cm 1530-1/D 1 item order online. This is probably the best micropore I've ever used. The dispenser is a joy to use and the quality of the micropore was very good. It's a brilliantly conceived idea the way the teeth cut the tape, far superior than ripping it over smaller teeth. I have used Micropore tape for many years and it is excellent - strong, supple and hypo allergenic - I am allergic to plasters. Dispenser excellent. Service from Farmaline is exceptional. 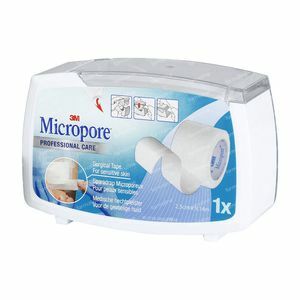 Micropore is a good plaster for small wounds f.e. blisters on the feet. It sticks well, easy to tear off and easy to remove without pain.